Bruker’s handheld XRF silver tester can be used to verify Silver (Ag) content in jewelry, solder, and any other sample type. Click here to request information about fast and accurate silver analysis and Bruker XRF silver testers. With uses in a variety of applications, knowing the quantity and purity of silver is important to a variety of industrial and consumer products. 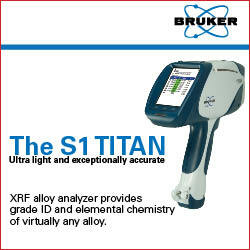 Bruker’s S1 TITAN silver analyzer is a 100% non-destructive, highly accurate, instantaneous silver analysis method. Bruker’s line of XRF silver analyzers come in a variety of models to meet all of these challenges and more, from analyzing scrap silver jewelry to identifying the proper solder for use in an important component. Click here now to get more information from Bruker’s silver analysis specialist or to request a quote.